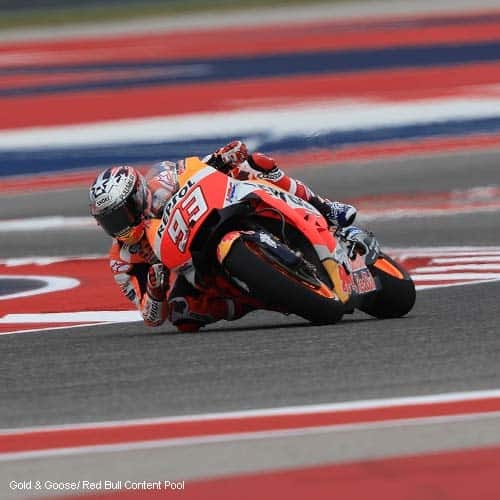 Known as the ‘Horsepower Rodeo’, the Red Bull Grand Prix of the Americas has been a part of the MotoGP™ calendar since 2013 and is fast growing in popularity amongst fans and riders alike – especially Marc Marquez due to his perfect record in Texas! The Grand Prix of the Americas is held at the state-of the-art, Circuit of the Americas (COTA), a 5.5km beast of a track consisting of 20 turns and a staggering 41 metres of elevation change across the whole circuit – the most of any MotoGP™ circuit! Previously described by Jorge Lorenzo as, “… really difficult and one of the hardest tracks to understand throughout my career”, COTA provides a massive challenge for all riders whilst ensuring an entertaining spectacle for fans! Crowds of over 100,000 over 3 days flood the gates of the COTA to experience the excitement and thrill of the MotoGP™ Red Bull Grand Prix of the Americas! Marc Marquez’s record at the Red Bull Grand Prix of the Americas is nothing short of impeccable, as history suggests he will certainly be the one to beat, but nothing is a certainty in the MotoGP™ and he has some stiff competition! Honda teammate and fellow countryman Jorge Lorenzo will no doubt be accustom to his Repsol Honda in 2020 and will be applying his buttery-smooth riding style to the COTA, vying to be a genuine contender! Whilst the ‘horses for courses’ factor favours Italian Andrea Dovizioso, being on the back of one of the most powerful bikes on the grid, factory Ducati, the COTA compliments the raw power of the factory Ducati, being one of the fastest circuits on the MotoGP™ calendar. Ducati teammate and Australian Jack Miller is also an inside chance on his Pramac Ducati – or better yet, factory Ducati, bearing a potential promotion at the end of 2019! Alex Rins proposes a huge threat entering his fourth year in the MotoGP™, tying in experience and a rapidly improving Suzuki, don’t count Rins out! Lastly, as long as MotoGP™ veteran and legend Valentino Rossi is on the grid and his Yamaha is good enough – he cannot be discounted, a wealth of experience and an abundance of skill always ensures ‘The Doctor’ is a viable chance! If you’d love to join us in Texas in 2020 to experience one of the newer circuits and races on the MotoGP™ calendar along with the bustling city of Austin, please take a moment to pre-register your interest by completing the form below. Once our MotoGP™ Red Bull Grand Prix of the Americas 2020 travel packages and tours are released, we’ll send you a notification email and message and if you’d like, you can arrange for one of our friendly travel experts to get in touch and discuss the packages and your travel requirements in further detail. * To get priority access to our packages and be one of the first customers contacted when our MotoGP™ Red Bull Grand Prix of the Americas 2020 travel packages and tours are released, please place a fully refundable $50 deposit after placing your enquiry. This will guarantee that you’ll receive the very best accommodation and ticket options from our range.